Yesterday's passing of actress/comic Phyllis Diller resulted in scores of tributes to the show business legend. As it happens, according to a batch of letters dating from 1994-2003, Diller was an enthusiastic supporter of my father's crackpot medical claims, including the Heimlich Institute's medical atrocity experiments on AIDS patients in China and Africa. 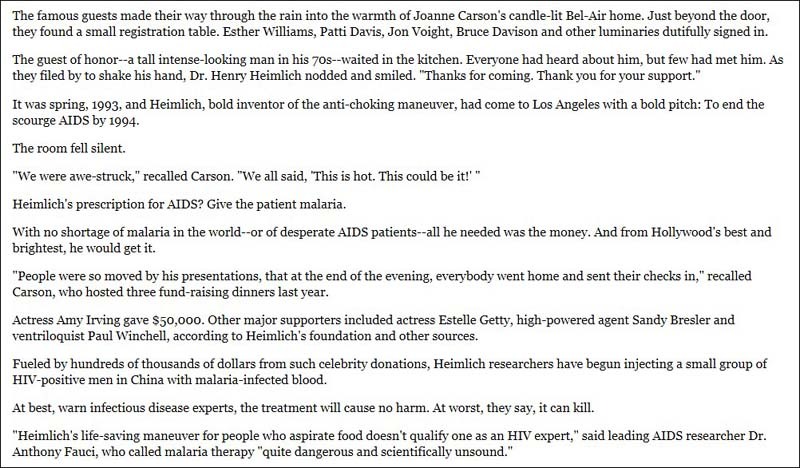 Based on the dates, the relationship may have started with the events reported in this must-read October 30, 1994 front-page Los Angeles Times article by Pamela Warrick, Heimlich's Audacious Maneuver: He proposes curing AIDS by giving patients malaria. Tests draw celebrity money--and researchers' protests. Well-meaning celebrities with more dollars than sense can be easy prey for scammers promising medical miracles and, based on Warrick's well-researched, lively article, my father had this bunch wrapped around his finger. In fairness to the stars he skinned, before her article, my father had a public image as a renowned medical genius and humanitarian. How could they know that he was just acting the role? One thing's for sure. He must have put on a good performance to fool a bunch of actors. 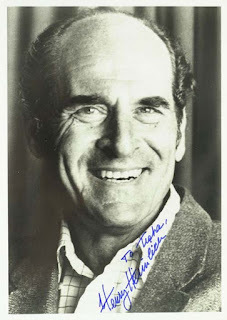 Okay, on to the correspondence between my father and Phyllis Diller. I found seven pages at HistoryForSale.com where, at this writing, you can purchase the originals starting at $999. Page down to view them all, but here are some choice screenshots. 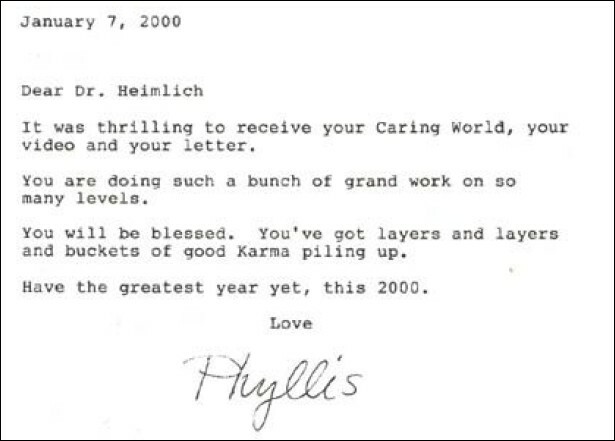 From a July 13, 1999 letter, five years after the LA Times article - "All my love"? Three years later, per the articles linked on my web page, the China experiments made national headlines after UCLA's Office of Human Subjects Protection launched an investigation as a result of a complaint I submitted under a pseudonym.